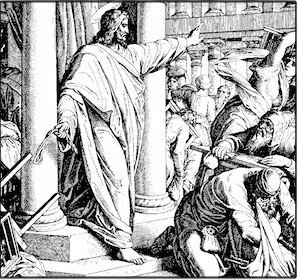 Jesus entered the temple in Jerusalem and saw rows of merchant stalls clogging the outer courts. Some were selling animals for the sacrifices. Others were changing money, since you could only buy the sacrificial animals with temple currency. Others were undoubtedly selling trinkets and religious souvenirs to commemorate your trip to the most important location in Israel. Instead of walking into a space of reverent or majestic worship, there was noise—people trading, shouting out bargains, the bleating of the animals. You can read one of the tellings here. If you just read this story without preconception, it seems for all the world like Jesus flipped out. He entered the temple, expecting to see people seeking God. But instead the swirling chaos of commerce declared that the priority here was something other than worship. The booths were taking up space that should have been available for women and gentiles—since neither of these groups were allowed to go further into the temple. The merchants were profiting off people’s need and desire to connect with God. The whole thing was a travesty. So what did Jesus do? Did he write a thoughtful theological treatise on appropriate use of the temple? Did he preach a measured sermon? Did he show his distain by leaving the temple? Nope. Jesus started tossing tables over. He raised his arm with a whip, chasing these merchants out of the temple. The way my teachers told the story, it almost sounded like Jesus quietly invited the merchants to leave. I didn’t know what it meant other than that it was more dignified. I imagined that Jesus walked quietly into the temple, subtly raised his eyebrow, and spoke in a quiet yet stern voice to the merchants. The whip was more of a symbol. That preserved the image of Jesus’ I was being raised with. Gentle. Perfect. Never emotional. Check out this old engraving. Like Robocop, Preternaturally-Calm-Jesus strides into the temple, restoring order with a raised hand and stern glare. You see power. You see poise. You don’t see any emotion. But picture is just not what the Bible shows. This is one of those places where Jesus gets emotional. Really. Not in an abstract, removed, theoretical, theological sense, but real emotions. The tightening of your gut. The flood of neurotransmitters in the brain. The blood rushing. The intensity of focus. This is what the story shows Jesus experiencing. The real emotion of anger. In my own “emotional recovery,” I’ve learned that anger is the emotion you feel when you or something you love is being violated. 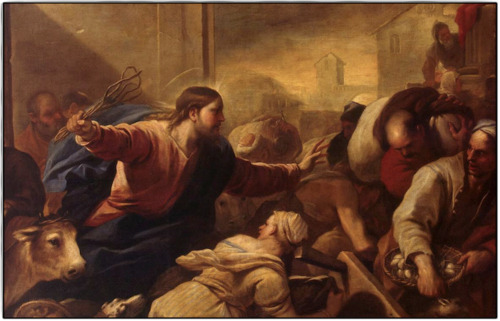 From that perspective, it seems like anger was an appropriate reaction for Jesus in the temple. He loved the temple, because it was his Father’s house. He loved the people who came seeking God there—especially the marginalized ones, like the women and gentiles, who weren’t allowed further into the temple by culture rules. He wanted people to be able to freely come to God. The scene in the temple violated all of that. There were people who needed to make sacrifices, but couldn’t because they couldn’t afford the inflated prices of the approved animals. People who had travelled from other countries to worship at the temple, but couldn’t because they were the wrong race. People who were so close to the space of intimacy with God, but couldn’t see it or experience it because their only focus was on their own profit and security. Deep things that Jesus loved were being violated. Anger is the right and natural—maybe even God-given—response to that. The idea that Jesus had emotions like this was uncomfortable for the Christians I grew up around. It wasn’t Jesus’ fault. It was about emotions. I don’t remember anyone saying this out loud, but for me it was clear as day. We were embarrassed by people expressing extreme grief, especially if it lasted too long. We were a little creeped out by people who were too happy. We didn’t trust the Charismatic Christians who were always talking about how God made them feel. This discomfort with emotions filtered the way we looked at God. The portrayals of Jesus that I saw growing up showed him as a quiet, slow-walking, spiritual guru who never grinned or played. He had too many spiritual things to think about for that. That picture seemed holy. It seemed pure. It seemed, well… safe. But believing that God has no emotions isn’t really safe. It’s terrible. God is our model. “I want to be like Jesus,” we sang growing up. 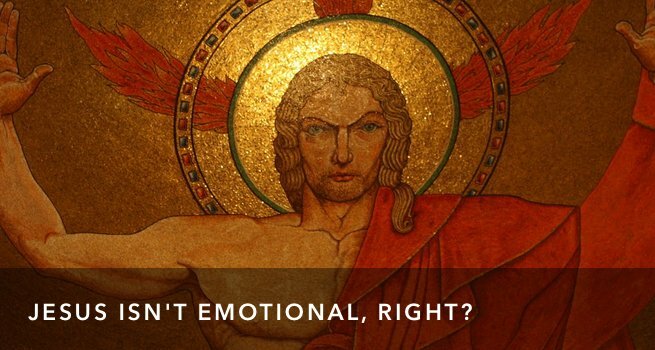 But if Jesus was never emotionally expressive, if God has no emotions, then what does that mean? The implication was clear to me: If we were going to become more spiritual, we had to become less emotional. So, what happens when you live in a community that affirms you for how spiritual and mature you are, when you think that being mature means being non-emotional? Easy. You stop showing emotion. Maybe you even stop feeling emotions – at least you try. And if you can’t stop, when you get emotional, you feel guilty, like you’ve done something wrong. Then, you stuff your emotion. You deny your emotion. You hide your emotions, all in an effort to look mature, or wise, or spiritual. But this pattern only led to a kind of Christian life that was inauthentic, disconnected, and shallow. I met a lot of wonderful, wise and spiritually mature people in the my religious tribe growing up. But those people were vastly outnumbered by immature, emotionally repressed people who were brittle, inflexible, and legalistic. We talked about God changing us; but that only seemed to mean that people stopped smoking, or drinking, or sleeping around. It never really meant that they became more kind, more gracious, or more open to serve the people around them generously. For the most part, it didn’t seem like we really expected that kind of transformation. But this brittle religified life (like calcified, only with religion as the thing that makes you hard) isn’t what we were made for. The Genesis creation story tells us that we were made in the image of God. Ephesians 4 tells us that God’s project today is maturing us in the image of Jesus. Simply put, this means God’s goal for us is that we become more whole, and as we do, we participate in God’s work of restoring the world. This is a journey of finding the freedom of who we were created to be, living fully the way God intended. Guess what? God made emotions. He created the bodies that we have along with the chemicals and electrical systems that make them work. He created our minds. He made the whole system work the way it does. Why? So that we could feel like He does as we come to know Him. The more we feel like God does, the more we will live and relate the way God does. That means a discipleship without emotional growth and healing will never get the job done. Emotions aren’t a distraction to following Jesus. They are a crucial part of a whole-life-surrendered, a maturing life made in the image of God.